The changes were subtle: First the heat became less relentless. Then in the markets there appeared new, colorful, “weird-looking” items. And on the streets’ sides grew small impromptu shops selling cakes of various types and sizes. No one noticed at first. 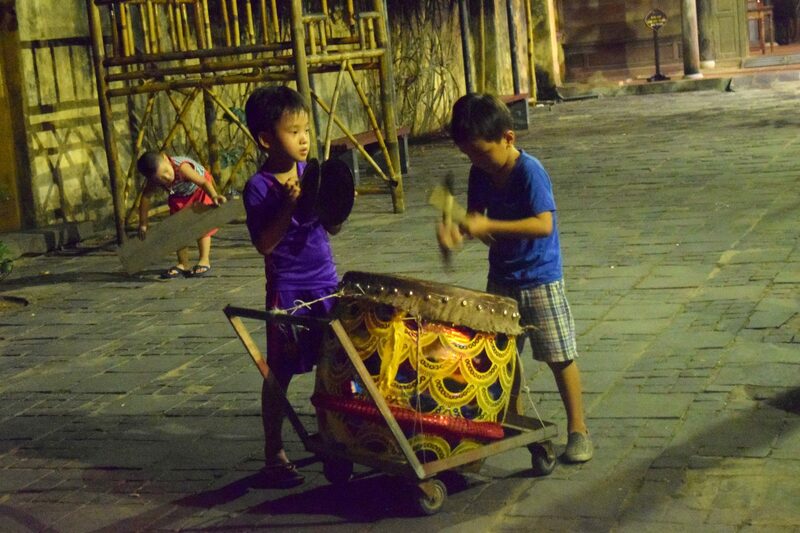 But then came the drums, the noises from which became increasingly hard to ignore. 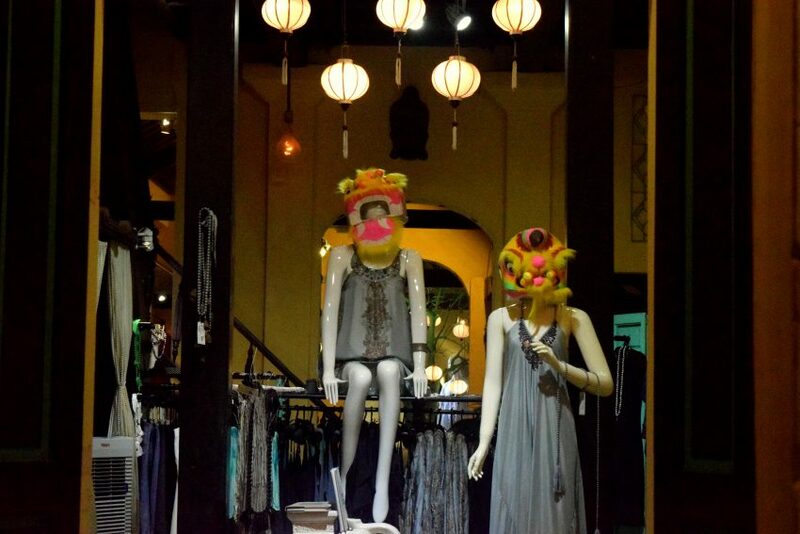 By the third week of our stay in Hoi An we all knew something special was going to happen. And it was the Mid-Autumn festival. 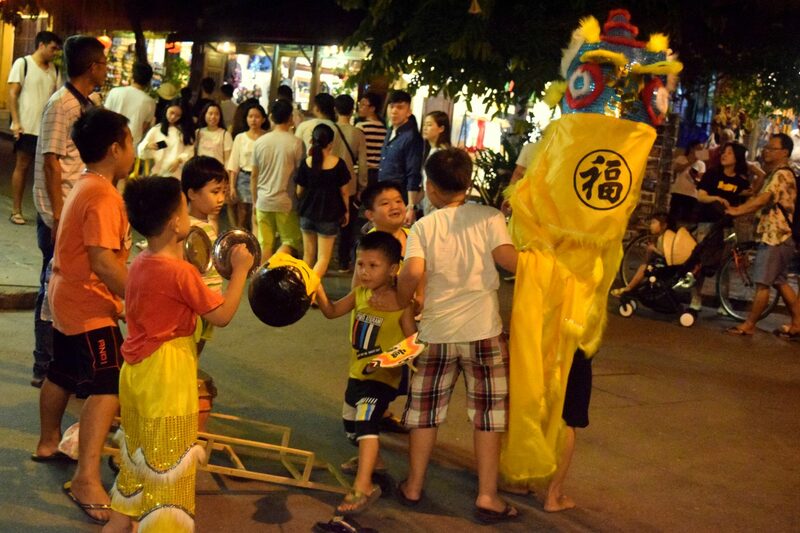 The festival is celebrated mostly by Vietnamese and Chinese people and takes place on the 15th day of the 8th month in Lunar calendar, which is believed to be the middle day of Autumn, thus the name Mid-Autumn festival. Traditionally, the festival created an occasion for family gatherings, as well as celebration of the moon and successful harvests. 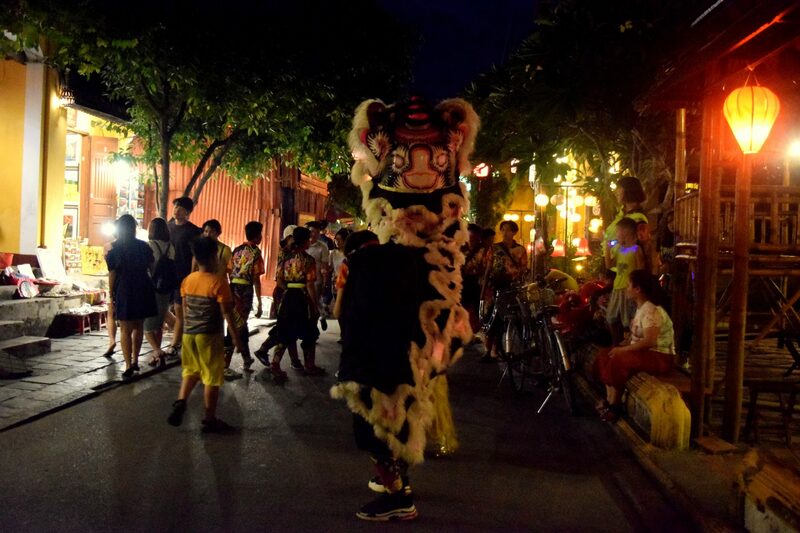 Practices associated with the festival includes eating moon-cakes, watching the moon and lion dances. This year, the festival fell on Monday of our 4th week in Hoi An, and with lights, tastes, sounds and people, it transformed the area into something different. The old town, which usually is already very crowded, became packed with tourists. The number of visitors peaked from 19h to 20h in the evening, when you could barely ride a bicycle through the area. There were more lanterns lit up. 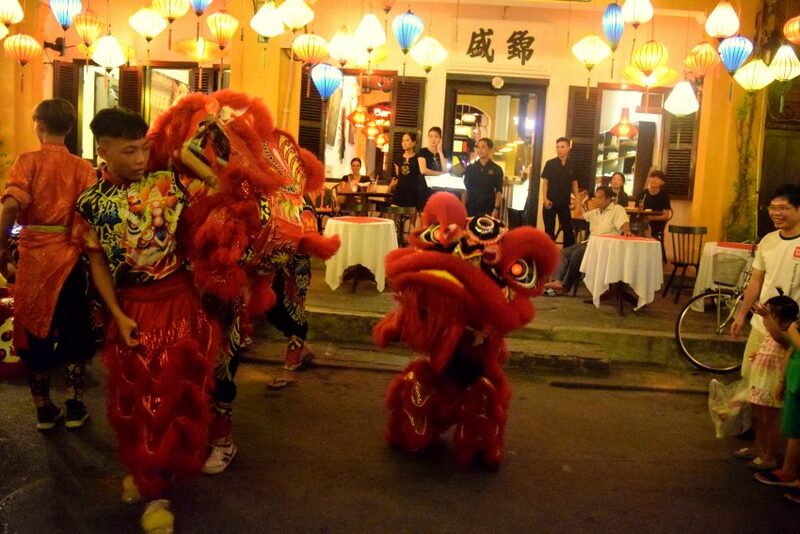 And you would not find it difficult to encounter a lion or dragon dance group parading on the streets. Lion and dragon dances are believed to bring good luck and scare off evil spirits so they are usually welcomed in shops as well as in homes. The town authority was quick in taking advantage of the occasion to promote local culture and image, organizing may cultural and entertainment activities around the old town area. One could argue that without so many visitors, the festival would not have been celebrated so big. Under the scrutiny of outsiders, the town itself and its citizens became more aware of how to present themselves, as well as of the many opportunities that came with the occasion: opportunities for additional incomes, but also for the town to be known by more people. Such opportunities encouraged the continuity of traditions, but also put that continuity on a thin line between conservation and commercialization. How much of this festival has been done authentically, and how much of it has been done under commercial thinking? These questions might be difficult to answer. However, one thing is clear: The festival has moved dramatically from the intimate settings of families and homes, out into the public spaces of streets, shops, and pubs, where everyone is a passerby who barely knows the person he/she is standing next to. Globalization has been a common theme going through many of our discussions in Development Studies 1. 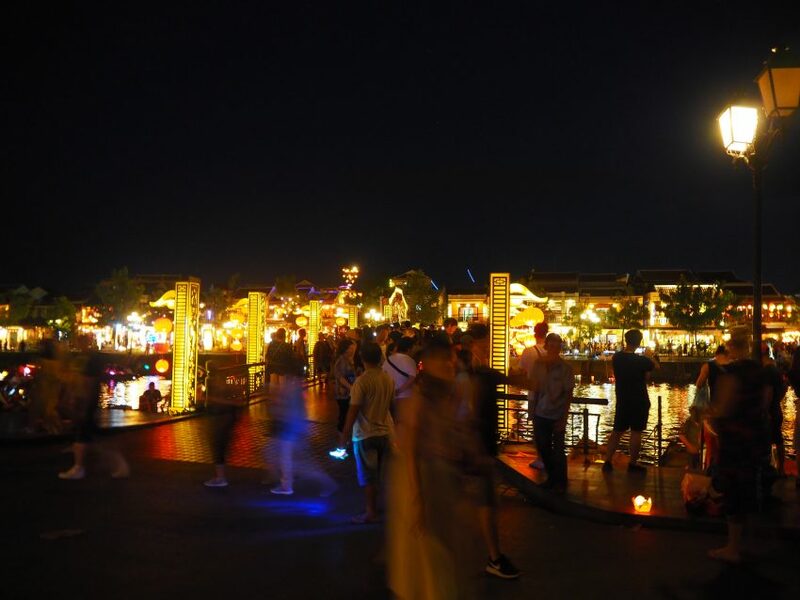 Such discussions become more relevant in the context of Hoi An, a town which in the past served as a major trading port with Portuguese, English, Japanese and Chinese presence, and which nowadays sees floods of visitors from all over the world. Globalization is also relevant to us, as one of our teachers puts it: “You are here studying partly because of globalization”. Globalization for sure has blurred out the borders between many things, but the Mid-Autumn festival reminded me of something that does not quite go into that trend: People celebrate the festival in Lunar calendar, according to which the 8th month does not really coincide with August. They look at the moon as a Goddess, not simply as the romantic moon usually providing inspirations for lovers, writers and song composers. Maybe what the Mid-Autumn festival reminded me of is the idea of parallel universes, that we all live in multiple universes, parallel but different. As such, the occasion gave us a chance to experience cultural diversity and appreciate simply being here in Vietnam. We had a gathering at a nice cozy coffee shop in town, drinking tea, doing quizzes and eating mooncakes. Probably it was globalization that brought us together, but we were glad that what we met here in Hoi An was not yet so globalized.